Some books are so terrific with their cultural backdrop that more than the story you begin taking interest in local customs, people, tribes, rituals, and so on. On the similar lines, we have The Lioness of Morocco by Julia Drosten, a historical fiction. The story opens in 1835 when colonization was taking roots in European culture. Sibylla Spencer is a strong-headed woman of twenty three, unmarried, and daughter of Spencer Shipping Company’s owner. She has different opinions about the life she is leading in London of 1835. Somehow, she gets on with Benjamin Hopkins, a clerk in Spencer Company. They get married. 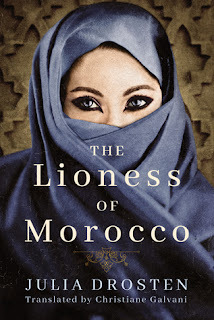 When Spencer Company’s Moroccan trade agent dies, Sibylla along with her husband moves to Morocco to handle business accounts. Once they are into Mogador, a port city in Morocco, the priorities in their lives begin changing and the love between them evaporated without showing signs of wisps. It is clear that Sibylla is not happy with Benjamin, but still for the sake of her two sons, she drags the relationship. Around the same time, she gets attracted to a French soldier Andre Rouston. They love each other and meet up secretly at a ruined Spanish church. Sibylla is unaware that her husband is engaged into slave trade and earning fortune. In fact, Benjamin confides in her no more. They live in one house, but do not trust each other, and often Benjamin remains out of home on account of business tour. Clearly, family spirit has broken down. Soon Benjamin is taken as a prison and sent to an isolated island on the charges of illegal business practices. Sibylla obtains the freedom of his husband with the help of that French soldier, but at that time, French invasion on Algeria spoils the reputation of Morocco as they fail to help France. As a result, French army captures Mogador and heavily bombards that island where Benjamin is kept prisoner. Benjamin is taken as dead, Sibylla later discovers that her husband wasn’t innocent; he was involved into slave trading. She was happy to lose her and have had all intentions to start afresh with Andre Rouston. But fate had some other planning for them in store. Will they meet, like the lovers who first part away and then reconcile? The story is not about Sibylla only, in fact as you progress you will find her sons and daughter Emily also struggling for some or other things. The culture presented in the book is of prominent value. The storyline is weak because the time span it covers is like rite of passage but still the main characters do not look converging to one focal point. The author left the French invasion part unfinished. The story is more about women of Mogador. Go for it if you liked abstract love stories or half-written historical war fictions. The plus side is that the book will take you on a cultural tour of North Africa. Binya is a poor little girl living with her mother and an elder brother, Bijju, in a very small hilly village of Garhwal. One day while herding her two cows back home, she stumbles upon some city people enjoying the picnic in the valley. She is enthralled to see them rich and well-groomed. She craves to be one like them and among many other things of their, a blue frilly umbrella catches her attention. She begins craving for it. On the other hand, the city people get attracted by her innocent beauty and the pendant in her neck. The pendant consists of leopard’s claw – which is considered a mascot widely in the hills. Binya trades her pendant off with the blue umbrella. The blue umbrella is so much beautiful that soon it becomes a topic of conversation for villagers and children adore her umbrella so much that every time they feel like to touch or hold it. Binya is on seventh heaven and rarely closes it because she believes it looks charming when it is opened. The Tale of Melon City by Vikram Seth is a humorous poem about a king who is just opposite the terms ‘just and placid’. Rather the king is excited about everything in his kingdom. The Accidental Tourist by Bill Bryson is a short story that highlights the importance of having suave and elegant manners at the time of travelling. In this story, we see that the narrator almost flies over 100,000 miles every year because of his job’s nature. So, we can say that the narrator is an accidental tourist, though he doesn’t enjoy travelling but still he has to because of his job. However in his own words he says that he is sort of a confused man who often forgets the roads and gets into wrong alleys or gets trapped into self-locking doors. In this story, he takes us to some of his awry travel experiences where he did some crazy things, though unwittingly. Most of his experiences are based around airports or inside the flights. On one instant, while flying to England from Boston with family for Christmas, he forcibly opened the zip of his bag, as a result it broke down and all the stuff littered on the ground. This made him embarrassed and the people around him. A Conspiracy of Violence by Susanna Gregory book review. A Passage to India by E.M. Forster Summary. analysis of the poem The Rain on the Roof by Coates Kinney. Book Review of An Era of Darkness by Shashi Tharoor. Book Review of Burmese Folktales by Madhu Gurung. Book Review of Despite Stolen Dreams by Anita Krishan. Book Review of Done with Her by Chirasree Bose. book review of In Borrowed Light by Barbara and Stephanie Keating. book review of Kohinoor by William Dalrymple & Anita Anand. Book Review of Letter from an Unknown Woman by Stefan Zweig. Book Review of Mannu Rikshewala by Tuhin. Book Review of Salvation of a Saint by Keigo Higashino. Book Review of The End of Something by Ernest Hemingway. Book Review of The Pearl That Broke Its Shell by Nadia Hashimi. Book review of The Testament by John Grisham. Ernie G. Perrault novels and books. explanation of the poem by Ozymandias by Percy Bysshe Shelley. Fall of Giants by Ken Follet book review. Fire and Ice by Paul Garrison summary. full summary of Heart of Darkness by Joseph Conrad. Idgah by Munshi Premchand summary. Mulk Raj Anand books online. Return of the Long Riders by Cliff Farrell book review. Shobha De life and work. Short stories by Sarat Chandra. summary of A Thousand Splendid Suns by Khaled Hosseini. summary of The Snows of Kilimanjaro by Ernest Hemingway. summary of 2 States by Chetan Bhagat. Summary of A Hundred Little Flames by Preeti Shenoy. Summary of A Line in the Sand by Gerald Seymour. summary of Avatar of A Protector by Chetan Thakkar. summary of Baaz by Anuja Chauhan. summary of Can't We Talk about Something more Pleasant? by Roz Chast. summary of Cat in the Rain by Ernest Hemingway. summary of Cross Country Snow by Ernest Hemingway. summary of Cry Wolf by Wilbur Smith. summary of Dawn of Dreams by Abdus Samad. summary of Death of Kings by Bernard Cornwell. Summary of Foot Soldiers by Ruskin Bond. summary of King Solomon’s Mines by H. Rider Haggard. summary of Love@Facebook by Nikita Singh. summary of Namak Ka Daroga by Munshi Premchand. summary of One Shot by Lee Child. summary of Padmavati by Sutapa Basu. summary of Sidney Sheldon’s Chasing Tomorrow by Tilly Bagshawe. summary of Silent Thunder by Andrea Davis Pinkney. summary of Sisters by Shobha De. summary of Sons and Lovers by D.H. Lawrence. summary of Starry Nights by Shobha De. summary of Swami and Friends by R.K. Narayan. summary of The Bone Clocks by David Mitchell. summary of the Buddha of the Brothel by Kris Advaya. summary of the Company of Women by Khuswant Singh. summary of The Dead Zone by Stephen King. summary of The Diary of a Young Girl by Anne Frank. summary of The Emperor of all Maladies by Siddhartha Mukherjee. summary of The Gift of the Magi by O. Henry. summary of The Glass Blowers by Daphne Du Maurier. summary of The Godfather by Mario Puzo. summary of The Kept Woman and Other Stories by Kamla Das. summary of The Kite Runner. summary of The Land That Time Forgot by Edgar Rice Burroughs. summary of The Last Tonga Ride by Ruskin Bond. summary of The Library of Fates novel. summary of The Monk Who Sold his Ferrari. summary of The Shining by Stephen King. summary of The Sicilian by Mario Puzo. summary of The Silkworm by Robert Galbraith. summary of The Summer of the Spanish Woman by Catherine Gaskin. summary of The Tree Bears Witness by Sharath Komarraju. summary of The Twentieth Wife by Indu Sudaresan. summary of The Woman in the Window by A.J. Finn. summary of Those Pricey Thakur Girls by Anuja Chauhan. summary of Three Men in a Boat by Jerome K Jerome. summary of Two by Gulzar. summary of Valhalla Rising by Clive Cussler. summary of Winter in Madrid by C J Sansom. summary of Wonder by R. J. Palacio. Terror in Eagle Basin by Cliff Farrell summary. the author of ‘Inkredia (Luwan of Brida)’. the author of An Anglo-Indian in Love. the author of Done With Her. the author of Gift of Confidence. the author of Rafflesia: The Banished Princes. the author of Safalta Shabdon Ka Khel Hai. the author of The Epic of Kautilya. the author of What is an Indian? The Dogs of War book review. the House of Christina book review. The Householder by P. Jhabvala summary. The Mark of Vishnu by Khushwant Singh summary. The Melodeon by Glendon Swarthout book review. book review of the Melodeon. The Shadow of the Crescent Moon Book Review. The Triumph of the Sun by Wilbur Smith summary. Three Cups of Tea by Greg Mortenson summary. Yann Martel Life of Pi summary.